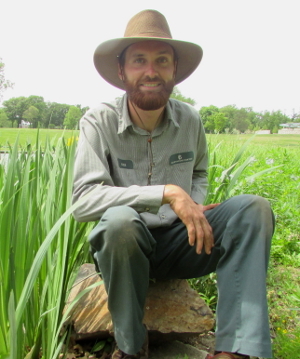 Kyle Cheesborough will be our July 2017 guest speaker and will give a program entitled Gardening for Biodiversity. Before starting at Bellefontaine Cemetery and Arboretum, Kyle’s career took him through nursery production, public gardening, plant collection expeditions, and much more. He developed an affinity for horticulture as a young man in Augusta, GA, helping his grandmother in her garden. Kyle attended the University of Georgia, receiving a Bachelor’s in Science of Agriculture, majoring in Horticulture while working for Goodness Grows, a wholesale/retail nursery specializing in unique, old-fashioned shrubs and perennials. He then spent a short time with an annual liner production facility in Mt. Vernon, WA, working in their Research & Development Department before accepting the position of Horticulturist I-Conservatories with the Missouri Botanical Garden. Kyle’s career with MBG saw a quick maturation of his abilities as a public gardens horticulturist and included a plant collections trip to the Altai Mountains in Siberia. Members of the Greater St Louis Daffodil Society are excited that Kyle has found time in his busy schedule to help us learn about Gardening for Biodiversity.